Please take a few minutes to read this page. It contains important information that's news to most consumers because it is not publicized or put on product labels. The 2013 revelation that government-approved "Pink Slime" is commonly added to meat products was a shocker to the American public. But that's just the tip of the iceberg in what's allowed in meat production. The biggest deception is that most families buy meat at the supermarket under the assumption that it comes from healthy animals. The reality is that almost all supermarket meat comes from government-sanctioned feedlots, where animals are fattened with feed and practices that are perversely unnatural and clearly unhealthy. Producing the most meat in the shortest period of time at the lowest possible cost is the only priority. But consumer demand for that meat would drop dramatically if the production process was transparent. As a result, feedlots are ALWAYS in remote locations. Public access is strictly forbidden. Without real images, we're left to imagine supermarket meat comes from animals lounging on sunny green pastures. That's not the case. "You are what you eat" is a common saying. But in regard to meat, it's much more accurate to say "You are what you eat EATS". "all of the above", in many cases. Then add crowded, stressful, unsanitary conditions on top of that, and you have a snapshot of how factory meat products destined for supermarkets are mass produced. Unhealthy animals lead to unhealthy meat products and ultimately, health issues in people. Suggestion: Go to Google and do a search for "images for animal feeding operations". You will see hundreds of appalling images that won't look like anything you will ever see on our farm. Antibiotic resistance is now recognized as a major threat to public health. Nevertheless, animals in factory farms are given doses of antibiotics -- both to keep them alive in stressful, unsanitary conditions, and to make them grow faster. According to a 2009 report by the FDA, factory farms used 29 million pounds of antibiotics in that year alone. Compare this to the 6 million pounds of antibiotics that are used for every man, woman and child in the US combined. The image to the right comes from an article in the New England Journal Of Medicine on the need to eliminate antibiotics from farm animals. 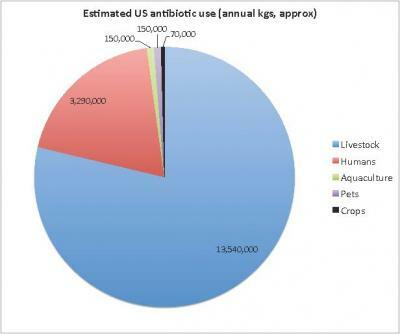 The blue section represents that amount of antibiotics given to livestock, while the red section shows human use. So if you're eating supermarket and deli meats that are not organic, it's logical to assume you are getting antibiotic residues at the same time. The government is finally asking meat producers to stop using antibiotics, but it's strictly voluntary. This negligent practice is largely responsible for the potent strains of antibiotic-resistant bacteria we are seeing today. The widespread use of antibiotics in farm animals leads to new strains, such as the now-widespread form of staph (MRSA) known as ST398. GMO is short for Genetically Modified Organism. Sometimes the term GE (Genetically Engineered) foods is used. When it comes to farm crops, it means that a gene from a non-plant species is forced into the genetic makeup (DNA) of a particular plant type. That never happens in nature. Some GMO crops are designed to survive being sprayed with the herbicide Roundup. These are know as "Roundup Ready" crops. The latest figures from the USDA say that 93% of the soybeans and 85% of the corn grown in the US for all uses is GMO. They are the two main farm crops fed to feedlot animals. While biotech companies were able to convince the US government that GMO food is safe and essentially the same an non-GMO food, they never had to prove it. And in recent years, studies have surfaced strongly suggesting that is NOT the case. Animals fed GMO foods have been shown to develop serious ailments, and there is ever increasing evidence that we are developing the same ailments. In fact, epidemiological patterns show there’s an identical rise in over 30 human diseases correlated with our increased usage of glyphosate and the increased prevalence of genetically engineered proteins in our food. Roundup is a powerful herbicide. The active ingredient is glyphosate. Virtually all feedlot animals have corn and/or soy as part of their feeding regiment. 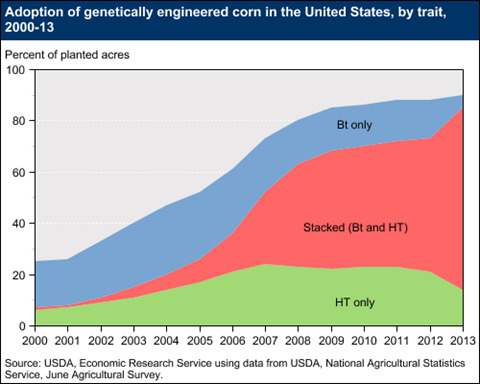 As mentioned above, almost all corn and soy produced today is GMO. Entire fields are liberally sprayed to kill weeds while leaving the crops unharmed. As a result, the soy and corn fed to animals is highly contaminated with glyphosate. "Glyphosate enhances the damaging effects of other food borne chemical residues and environmental toxins. Negative impact on the body is insidious and manifests slowly over time as inflammation damages cellular systems throughout the body." Our meat will cost more than supermarket meat, because it takes more hours and calendar time to raise animals naturally. However, it's not a true comparison because they are not equivalent products, both in terms of the bountiful healthful components in our meats, and in terms of the "contaminants" that are missing from our meats. If you value your health, don't skimp on the quality of your family's food. There is no better investment you can make than in your health. Please consider making our farm your family's source for healthy pastured meats.